This week last year, the Duke won his first academy award for his role as Rooster Coburn in “True Grit.” We love John Wayne around here, and we loved his Chinese cook and cat! Here’s what’s cooking for you at week’s end: chicken carbonara with bow tie pasta and shrimp étouffée. Chicken carbonara with bow tie pasta. We have bow tie pasta swimming in a creamy white sauce with lots of fine friends — oven-roasted chicken breast, mushrooms, garden fresh veggies, and green onions. Hey, anybody named Rooster Coburn would love this chicken dish. We’re just hoping he shows with Kate Hepburn and that crazy gatling gun. Isn’t it funny how a good-looking, smart woman and a cool gun can make a difference? Come get some chicken, it’ll do you just right. And, you might get to shoot a gatling gun. Shrimptastic Friday: Shrimp étouffée with rice. Shrimp lovingly cooked with tomatoes, other tasty veggies, and delectable Cajun spices in a delicious sauce served over Louisiana rice will make you boogie up and down the street. Rooster is galloping his way toward us on Friday, both guns blazing and reins held tightly in his teeth — he wants his shrimp étouffée. What a way to start the weekend! General Sterling Price will be here — apparently he’s a big shrimp eater, too. 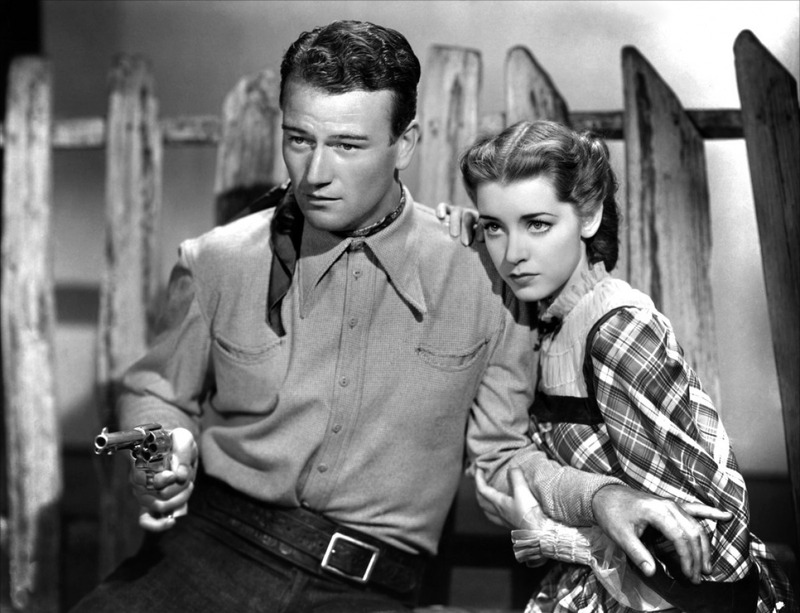 The young Duke in 1937’s “Born to the West,” gun in hand and a cute girl (Marsha Hunt) on his arm. The Duke observed about movie fights one time, “All the screen cowboys behaved like real gentlemen. They didn’t drink, they didn’t smoke. When they knocked the bad guy down, they always stood with their fists up, waiting for the heavy to get back on his feet. I decided I was going to drag the bad guy to his feet and keep hitting him.” Well, doesn’t everybody like giving it to the bad guys John Wayne style — nothing more gentle than a good knuckle-busting fight?